Unity Consciousness: Are The Cloud, Noosphere and The Singularity Intertwined? To some this global financial downturn may seem like a destructive event, but from the perspective of the emergence of unity consciousness, this socio-economic crisis is actually a constructive event that paves the way for the civilisation of the future. What is unity consciousness? Oneness is not an attribute of ourselves as individuals. Oneness is manifest via our relationships with others and the Divine! As the Indian mystic Vivekananda said in the late 19th century, "All differences in this world are of degree, and not of kind, because oneness is the secret of everything!" The small and beautiful humbling forces for tranquility and peace include love, laughter, being grateful, showing respect and forgiveness. Tranquility and peace are important because they remind us of our connectivity with the Supra Universal Consciousness and with each other as One collective entity. If we look closely, the collective consciousness is rising all around us via the Noosphere. 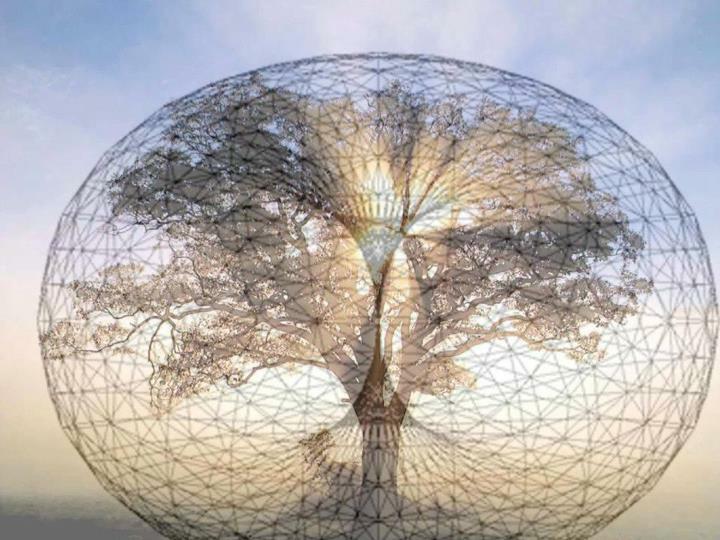 The Noosphere can be seen as the "sphere of human thought" being derived from the Greek vou? ("nous") meaning "mind" in the style of "atmosphere" and "biosphere". In the original works of Teilhard de Chardin as well as Vladimir Vernadsky, the Noosphere is the third in a succession of phases of development of the Earth, after the Geosphere — inanimate matter — and the Biosphere — biological life. Just as the emergence of life fundamentally transformed the Geosphere, the emergence of collective human cognition and Unity Consciousness fundamentally transforms the Biosphere. The Noosphere is becoming more evident via internet, web and mobile communities. Cloud computing is ubiquitous and removing the separation imposed by distance, ie, we are all accessible and can access each other anywhere and everywhere, all at once, thereby displaying Quantum Entanglement type phenomena! As a result, increasingly one is showered with synchronicity reinforcing patterns of the unifying energy field -- the Singularity -- in everyone and everything: all manifest in real time as One. At the same time, The Great Unwind and The Great Reset in the global economy have synchronicity, severity, speed and scale that are historically unprecedented, resulting in a shift in collective consciousness towards ever greater unity. The natural turbulences and cascading effects from tornadoes and tsunamis, earthquakes and volcanoes are also unprecedented. In the 21st century, we are much more connected with each other digitally and the spiritual or trans-physical connections, events, happenings -- that have always been there -- are beginning to demonstrate their own unifying presence via showers of synchronicity, that portend the Singularity via self-explaining signs or signatures. Those signatures come in the shape of events, happenings or connections that we may call "Haps!" Synchronicity is obvious with the rising level of individual and unity consciousness in regard to our holistic inter-connectivity in space and time -- enabled physically, digitally and through the primordial and ever present transcendental heightened connectivity. More connectivity creates the opportunity for more Haps taking place in unison. 5. The Noosphere's -- The Sphere of human thought's -- role is vast in helping to eliminate "manipulations, errors and omissions" by hierarchical authorities and to raise "collective consciousness" to reach the "Omega point" via the global internet, web and mobile technologies as well as inner spiritual progress. This provokes all to understand "who am I and what is my purpose?" The French philosopher Teilhard de Chardin emphasises the way that geography and distance are eliminated as human minds coalesce to solve a problem or fight a common enemy eventually to reach the "Omega point." Teilhard de Chardin said, "The age of nations is past. The task before us now, if we would not perish, is to build the earth." The Noosphere's emergence is transforming everything it comes into contact with. In this sense there is the idea of some universal energy field -- Singularity -- from which all this connectivity and unity is emerging very rapidly. The Noosphere can be thought of as a layer of the collective and connective mind(s) coalescing into one. Connective intelligence, collective intelligence, and corrective intelligence all unite through interaction in this emergent infinite field. In Astrophysics, the Singularity is "A point in space-time at which gravitational forces cause matter to have infinite density and infinitesimal volume, and space and time to become infinitely distorted." In Mathematics, the Singularity is, "A point at which the derivative does not exist for a given function but every neighbourhood of which contains points for which the derivative exists. Also called singular point." 1. Bio-technology and Genetic Engineering: What happens as we are able to understand and to design genetically engineered organisms freely? And we make bodies or new life forms with whatever attributes we want, what next? What are the consequences -- benign and diabolical? 2. Informatics and Artificial Intelligence: The pervasive anywhere anytime digital computing and connectivity via mobile telephones, the internet and satellite navigation has now created a holistic cybersphere where we live our visible and tangible lives both at the physical and non-physical levels simultaneously. What happens as computers become smarter than we are in certain critical areas? What happens as those computers are a million times smarter than any of us in certain critical areas? What can they do that we are not even able to comprehend? 3. Nanotechnology: This ultimately allows us complete control over physical matter, so that we can step-by-step build any physical object we may imagine or require via molecular assemblers, at near-zero marginal cost and locally. What are the implications in regard to de-globalisation? The Singularity is both a potentially wonderful, but also a somewhat worrying Happening or "Hap" portending "Total Chaos" for those who may have concerns associated with the omni-presence of the benevolent Supra Universal Consciousness as the guiding force showering us with Synchronicity signatures in All instances. This is where the message of unity -- like the universal spiritual messages of rejuvenation -- becomes very important for humanity. The "point" of the Singularity is reached essentially when all of the scientific and technological innovation trends appear to go out of control at the human level, ie, they have moved beyond our event horizon, and we can no longer follow along any previous linear logic or understanding to comprehend their combined effects. That technological change is instantaneous, omnipresent, omniscient, and omnipotent, the characteristics of the Singularity and the Supra Universal Consciousness. What, we might ask, if natural forces or the technology enabled systems decide that the majority of us are no longer relevant? We may not have the answer for this redundancy if we consider ourselves as separate from the unified holistic system. However, if we are willing to consider the Supra Universal Consciousness (SUC) as the Singularity itself -- defined by our sum total collective consciousness manifest both within and without the universe -- then that SUC is already providing clues via synchronicity showers that portend Itself, ie, the tangible arrival of The Singularity's presence in our age manifest as "Self-Aware Supra-Intelligent Totally-Organised Chaos" which is timeless and existent simultaneously in the past, present and future. The Roman philosopher Cicero observed more than two thousand years ago, "Everything is alive; everything is interconnected!" or "Omnia vivunt, omnia inter se conexa!" In other words, the Singularity -- the unifying energy field with infinite potential -- has always been there. It will be easy for more and more to perceive that Singularity's presence in the near future via its signatures that are showering all with synchronicity manifest events, ie, Happenings or just plain "Haps"! We are all conscious of the power of love and in that spirit let us contemplate peace, felicity and well being across the world as the "Haps" evolve us towards the Omega Point: Chrysalis to Cloud, Omniscience to Butterfly!